A subscriber list is a group of people you can send emails to. You can create and manage your Campaign Monitor mailing lists without leaving Salesforce via our subscriber list tab. If you already have lists set up in Campaign Monitor these will be pulled into Salesforce during the setup process. Details - Change the list name, type and unsubscribe settings. Statistics - View statistics for this list. Members - See who belongs to the list, search for a specific person. Create Records - Create Salesforce records from Campaign Monitor subscribers. Subscriber Rules - Rules to add or remove contacts or leads automatically. Field Mappings - Map Salesforce fields to Campaign Monitor fields. Import Wizard - Import your Salesforce records into Campaign Monitor. 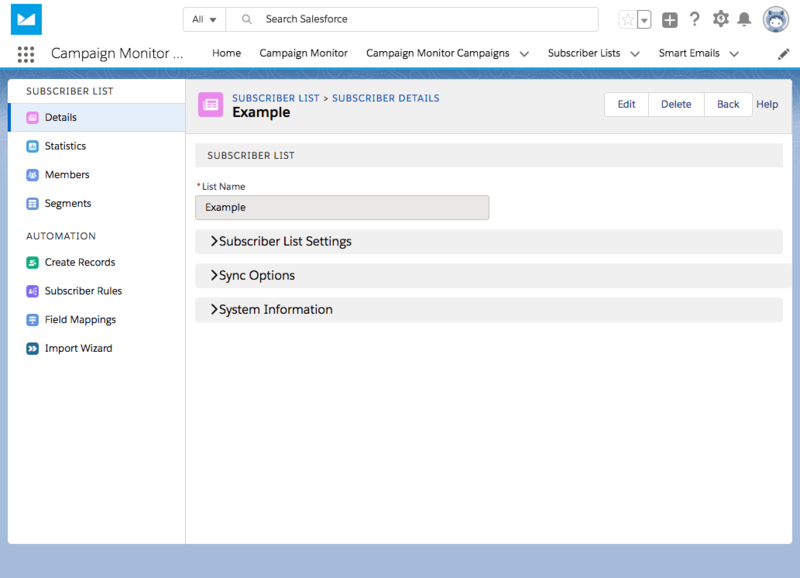 You can create a subscriber list in Salesforce, it will instantly be added to Campaign Monitor. If you have created the list in Campaign Monitor the primary sync will need to run for it to appear in Salesforce. In Salesforce go to the Campaign Monitor app. The list is single or confirmed opt-in. Optionally select Prevent Member Sync to save on storage space. 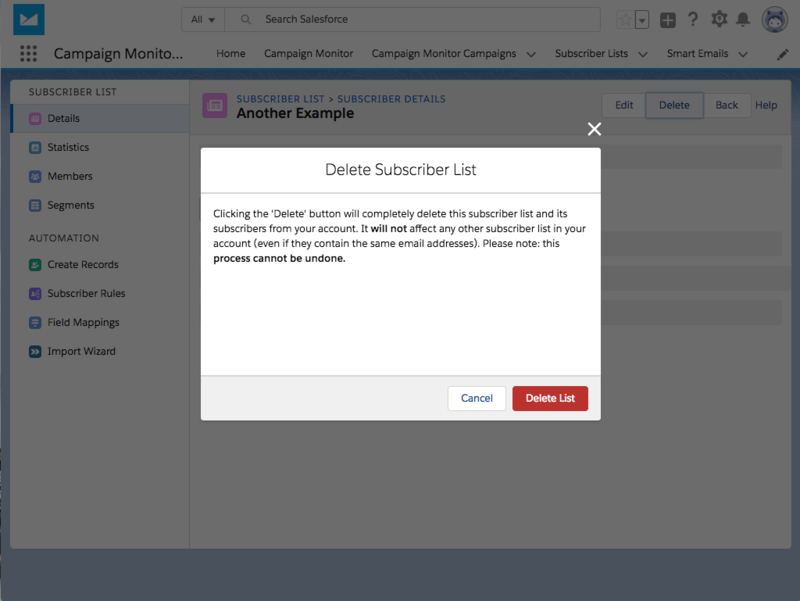 You can delete a subscriber list in Salesforce, it will instantly be removed from Campaign Monitor. If you have deleted a list in Campaign Monitor the primary sync will need to run for it to be removed from Salesforce. Click the Subscriber Lists tab. Click on the list you want to Delete. You will be prompted to confirm list deletion.